The DIBS Payment Window includes a functionality which allows you to change the look to some extend. 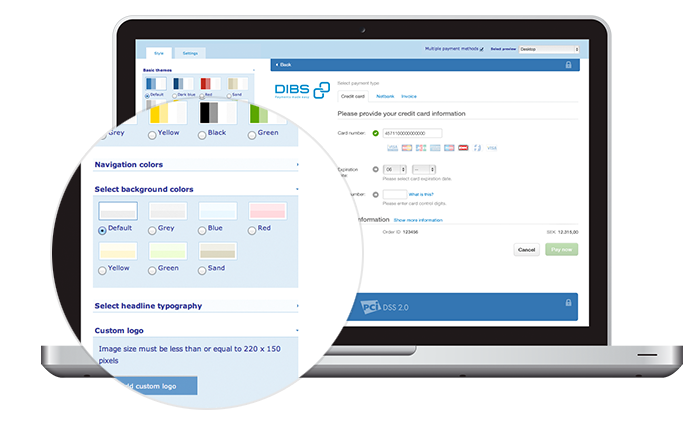 Through the user interface in the DIBS Administration, the theme as well as various options can be changed. Through the interface shown to the right, the look of the payment window can be customized. The changes affects the payment window in all states, as it automatically adjusts to the screen size of the sevice using it. The basic integration therefore shows a payment window which adjusts to be user friendly for both desktop, tablet and mobile customers. Various options give the possibility of changing the colors of the different sections of the window as well as selecting the typography used. Furthermore the company's logo can be uploaded to be shown in the window (replacing the DIBS logo shown to the right). Aside from colors and style, the basic setup of the window can be changed using the setting menu.